Thank you very much for a successful Book Signing this past weekend at the Marine Corps Exchange in Washington, DC. It was so great to meet many of you this holiday season. I am grateful for your support and excitement at the story and the continued adventures of Ford Stevens. The most thrilling part was in each of you sharing how touched you were at the characters, the medical issues you read about, and how you related to the developing story. Thank you for sharing them with me. As an example, Mr. John Schlutert, a military veteran and 30-year police officer veteran, posted his review here on Amazon for you to read. A review with full emotion…thank you very much, John. This has been an excellent year and I look forward to bringing you “The Black Scorpion Pilot” in 2018. You’ll meet up again with many of your favorite characters like Ford, Calvin, Michelle, Emily and Mark. 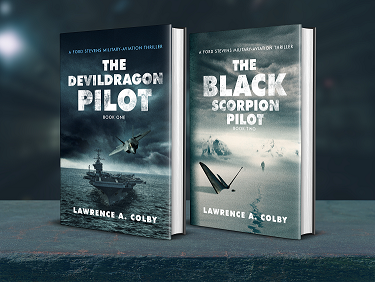 I hope you’ll like the story as much as you liked “The Devil Dragon Pilot“! I’ll let you in on a small secret: Ford will suffer a little in Black Scorpion and go through something extraordinary, but through suffering comes growth. He will go through an experience that will change him for life. Next year will be a great one for Air Force Reserve Captain Ford Stevens! May your holiday be filled with joy and peace this season. Wishing you a wonderful holiday and terrific New Year! Again, thank you for your kind support.